Coordinated patterns of grey matter can be described as a network (Mechelli et al., 2005; Lerch et al., 2006; Bassett et al., 2008; He et al., 2008). Brain areas that correlate in size are often implied in sub-networks that underlie specific cognitive functions. For example, areas involved in visual processing grow in a coordinated way (Andrews et al., 1997). In Alzheimer's disease, grey matter networks are disrupted (He et al., 2008; Yao et al, 2010; Seeley et al., 2009; Tijms et al., 2013, 2014, 2015), and related to disease severity and dysfunction in specific cognitive domains (Tijms et al., 2013; 2014). But, it is unclear at which point in time such disruptions arise. Abnormal Aβ 1-42 (Aβ42) levels in cerebrospinal fluid (CSF) have shown to be predictive for progression to AD dementia in non-demented elderly. In this study we investigated if grey matter connectivity is associated with incident clinical progression in non-demented, amyloid positive subjects. Betty Tijms is fascinated by the brain's capability to learn and adjust itself in health and disease, and so she studied Psychology at the UVA in Amsterdam, the Netherlands. After her MSc studies she moved to Edinburgh in the United Kingdom to study Neuroinformatics at the University of Edinburgh, and obtained her PhD in 2012. 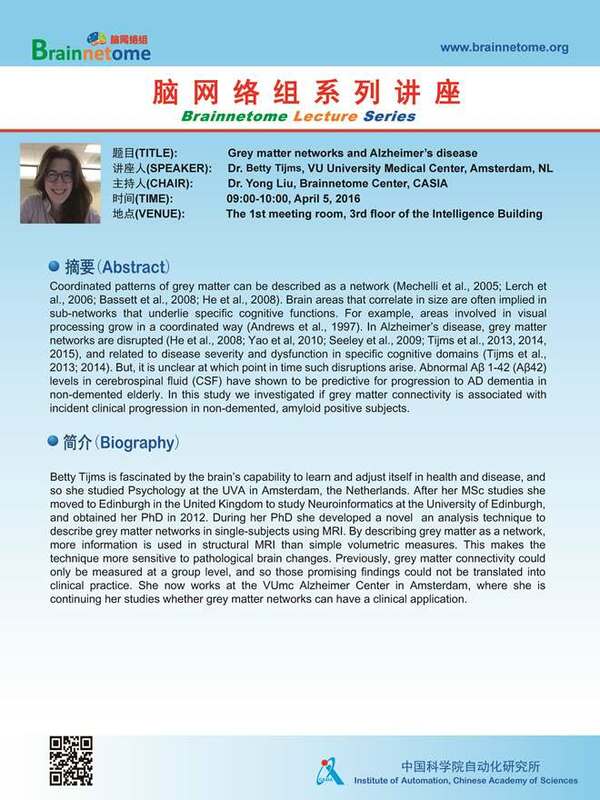 During her PhD she developed a novel an analysis technique to describe grey matter networks in single-subjects using MRI. By describing grey matter as a network, more information is used in structural MRI than simple volumetric measures. This makes the technique more sensitive to pathological brain changes. Previously, grey matter connectivity could only be measured at a group level, and so those promising findings could not be translated into clinical practice. She now works at the VUmc Alzheimer Center in Amsterdam, where she is continuing her studies whether grey matter networks can have a clinical application.